Bookmarks used to be called named extents in Essentials. A bookmark is a shortcut that enables end users to jump the map to a particular map extent. For example, you could configure a bookmark named Downtown that encompasses the city center. When an end user selects the Downtown bookmark, the map automatically pans and zooms to the extent of Downtown. If there are particular bookmarks that you want to make available to end users, you can configure them in Manager. This saves the bookmarks in the site configuration so that all users have access to them. In addition, end users can create their own bookmarks. Bookmarks that are created by an end user exist only for the duration of the session—when the user closes the viewer, the bookmarks disappear. To save bookmarks across sessions, a signed-in user can save a project, provided the viewer supports projects. For information about projects, see Project Module. If you want a particular viewer to support bookmarks, you must make the Bookmarks tool or map widget available in the viewer. Create Bookmarks in Manager: See Add a Bookmark. Configure Bookmarks in an HTML5 Viewer: See Configure Map Widgets for an HTML5 Viewer for instructions. Navigate the map preview to the desired extent. Enter the coordinates of the desired extent. Manager's Map page has an Extents tab where you configure bookmarks. 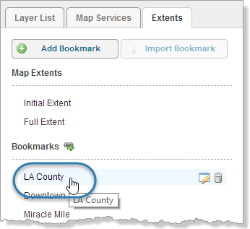 To zoom the map preview to a bookmark, click the bookmark on the Extents tab. In Manager, edit the site that you want to configure, click Map in the side panel, and then click the Extents tab. Pan and zoom the map preview to show the extent that you want to add a bookmark for. A new bookmark appears at the bottom of the list on the Extents tab. The new bookmark has the same extent as the map preview. Type a name for the bookmark and press Enter. Bookmark names can contain spaces and special characters. A new bookmark appears at the bottom of the list on the Extents tab. Click the Edit icon beside the new bookmark. Edit each coordinate that you want to change. To change a coordinate, click in the box and edit the value. The coordinates that you enter must be in the same spatial reference as the map. You can edit all four coordinates at one time using copy and paste (Ctrl-C and Ctrl-V). Copy them as a comma-delimited list, for example, -80, -160, 80, 160. Paste them into any one of the boxes. Essentials will sort them into the correct boxes. On the Extents tab, click the new bookmark. The map preview updates to show the bookmark, so you can verify it. For an imported bookmark to work, it must be in the same spatial reference as the map. In Manager, edit the site that you want to configure, click Map in the side panel, and then click the Extents tab.. If the Import Bookmark button is grayed out, click Apply Changes to make the button available. Select the site where the bookmarks are configured, and then click Next. Select the bookmarks that you want to import. To select multiple bookmarks, hold the Ctrl key down while selecting. The bookmarks are added to the bottom of the list on the Extents tab. This procedure explains how to change the bookmark's display name by editing the bookmark. You can also change a bookmark's display name by double-clicking the bookmark on the Extents tab. Position the pointer over the bookmark. Click in the Display Name box and edit the name. Pan and zoom the map preview to show the extent that you want to use. On the Extents tab, position the pointer over the bookmark. On the Extents tab, click the bookmark. Position the pointer over the bookmark that you want to remove. Bookmarks appear in the viewer in the same order that they appear on the Map page's Extents tab. You can change the list of bookmarks so they appear in a sensible order. For example, you could order the list with the bookmarks that you expect to be used the most at the top of the list. If the list is long, this saves the end user having to scroll the list. Click and hold a bookmark that you want to move to a different position in the list. Drag the bookmark to the desired position. A guideline shows where the bookmark can be placed. Continue to move bookmarks until the list is sorted the way that you want it.